2013 Lexus RX Pros and Cons: Why (Not) This Car? Introduced for the 1999 model year, the Lexus RX was the first upscale car-based crossover. An immediate success, it has defined the segment ever since. But few of the buyers who have made the RX a best-seller have been driving enthusiasts (or those who buy cars based on their advice). With even BMW now catering to Lexus's core luxury market, Toyota's premium brand has been compelled to counterattack the Germans, most recently with a line of "F Sport" models. The GS and even the LS make sense in this role, as they are rear-wheel-drive sedans. But the RX 350 F Sport, with its front-wheel-drive Camry roots? To Lexus's credit, they're not offering the RX 350 F Sport in front-wheel-drive form. Upgrades for the F Sport include a more aggressive front fascia (that eliminates the regular RX 350's weak chin), gray 19-inch wheels, firmer tuning for the suspension and steering, VDIM (a single computer controls and integrates the throttle, ABS, brake assist, traction control, and stability control), and the world's first eight-speed transaxle--with shift paddles. Do these tweaks manage to transform the RX 350 into a driver's car? Where are the seat heater switches? Why the 2013 Lexus RX? The strongest advantage of any Lexus over its German competitors isn't how it looks or how it drives, but how long it lasts without becoming a headache. The LS large luxury sedan might be the king here, but the RX also does very well based on our members' Car Reliability Survey responses. For the 2010s, the first model year of the current generation, not a single owner (out of 30 participating) reported a repair during 2012. For the 2004s, the first model year of the second-generation RX, only two out of 29 owners reported a repair. This would be impressive for new cars, much less some that have been driven about 90,000 miles while aging for eight years. One caveat: the 2013 Lexus RX 350 F Sport (and only the F Sport) is the first (and so far only) model equipped with Toyota's new eight-speed automatic transaxle. New transmission designs often have teething issues, which probably explains why Toyota/Lexus is only offering it in a single low-volume application this year. Buy an RX 350 F Sport, and for no additional charge you can beta test the new transmission! We don't have reliability data for the current Cadillac SRX (not quite enough owners have signed up yet), but judging from other GM models one probably would not age as well. I'm giving it the benefit of the doubt by rating the Lexus only "better" rather than "much better." Check the latest Lexus RX reliability stats. Lexus have also tended to be more comfortable than competitors. The front seats in the RX are generously sized and very comfortably shaped. They're softer than those in competitors (the Cadillac SRX's buckets are borderline hard), yet are properly supportive. Though the side bolsters aren't large--only the upholstery, black with white perforations, differs from the regular RX 350--lateral support is sufficient for how the Lexus asks to be driven (we'll get to this). Sportier roofline than most crossovers, yet cargo volume is among the best. Instruments recall those that impressed in the 1990 Lexus LS, but others now put on a bigger show. The Lexus RX 350 F Sport can hold 40 cubic feet of cargo with the rear seat up, and twice as much with it folded. While cargo volume specs can be cheated, these don't appear to have been. The RX's cargo area is about the largest available for a two-row crossover, and nearly as large as that in the three-row Acura MDX. The Cadillac SRX, though a couple inches longer and an inch wider than the RX, can tote only three-quarters as much of your stuff. Cargo volume is also a key advantage over the new, half-size-smaller Acura RDX. With a 270-horsepower 3.5-liter V6 to motivate 4,510 pounds, the Lexus RX F Sport isn't sluggish, but it isn't especially quick, either. The F Sport tweaks don't touch the engine (whose output lags the competitions'), and the transmission's two additional gears have a negligible impact on full-throttle acceleration. Lexus claims 7.7 seconds to sixty, a tenth quicker than the non-F. (The actual benefit is a little larger, as the F Sport has to shift twice rather than once due to shorter gearing.) The 308-horsepower SRX is nearly a second quicker. So what's good about this powertrain's behavior? Refinement. Though the V6 doesn't sound as sweet here as in the IS and GS (where it's direct-injected), it still sounds much better than the relatively uncouth, loudly roaring unit in the Cadillac. And, together with the transmission, the engine goes about its business very smoothly. Most shifts in casual driving are imperceptible. Engine speed changes less with each shift due to the more closely spaced gears of the new transmission. In contrast, the quicker Cadillac's transmission constantly draws attention to itself, reacting more slowly to driver inputs then often bumping into the new gear when it finally does. The new transmission doesn't affect EPA city mpg, which remains a competitive if not outstanding 18. Highway mpg receives a bump from 24 to 26, putting it two to three mpg over most competitors. At a steady 75 mph, the F Sport engine is spinning 1,950 rpm, vs. 2,300 in the regular RX with a six-speed automatic. In suburban driving with the engine warmed up the trip computer typically reported 22 mpg. A very light foot bumped this by three mpg, while a heavy one sunk it by about the same. Buyers who put a high priority on fuel economy will prefer the RX 400h hybrid. It earns EPA ratings of 32 city, 28 highway, and is even a little quicker than the RX 350. Real-world suburban mpg appears to be about 29. Why Not the 2013 Lexus RX? Historically, ride smoothness has also been a key Lexus advantage. Unfortunately, the F Sport tweaks have destroyed the RX 350's normally admirable ride quality. While the resulting motions don't quite deserve to be called harsh, the RX 350 F Sport thumps and bumps more firmly and loudly than all but the stiffest competitors over even minor road surface flaws. While the Cadillac's suspension tuning is at least as aggressive, it does a much better job of taking the edge off the small stuff. Aside from tire thump, the RX 350 F Sport is fairly quiet inside. Lexus initially surprised everyone by making its cars extraordinarily quiet. The cars haven't gotten noisier, but the rest of the industry has caught up. So no "why to buy" in this area. The Lexus RX 350 F Sport's poor ride quality might (almost) be forgiven if the firm suspension delivered spectacular handling. But roll has been reduced only a little, and the weighting of the firmer steering actually makes the crossover seem much less willing to turn. "Ponderous" repeatedly leapt to mind. I actually enjoyed driving the regular, easier steering Lexus RX more. I never thought of the Cadillac SRX as fun to drive--until I drove a 2013 back-to-back with the F Sport Lexus. The SRX feels more willing to turn, and more composed and balanced in hard turns. Its steering also feels more direct and linear, if not much more communicative. (Cadillac hasn't reported any improvements to the steering for 2013, but it felt much better to me this time around. Just because of the reference point provided by the Lexus?) The SRX's handling benefits from an active rear differential, which counteracts understeer. Other crossovers increasingly employ brake-based torque vectoring. The Lexus has neither. The VDIM (vehicle dynamics integrated management) system, standard and only available on the F Sport, actually proved more intrusive than the conventional stability control system used in the non-F'd RX 350. It often cut the throttle in hard turns and generally lacked finesse. I resorted to turning the system off--which is much more difficult than it ought to be. You have to hold the button for over three seconds with the vehicle completely stopped. In the F Sport's defense, few drivers will push it as hard as I did. But by this measure few drivers need the handling the F Sport team intended to deliver. Lexus's new spindle grille, added for 2013, has few fans. F Sport fascia eliminates weak chin. Lexus has been lagging competitors in offering the latest features. Equip an SRX as similarly as possible to the tested RX 350 F Sport ($51,670 with nav, obstacle detection, and blind spot monitor), and it stickers for only $240 less. But adjust for the Cadillac's additional features and its advantage widens to $2,785. Items not offered on the RX 350 F Sport include a panoramic sunroof (rather than a conventional one), heated rear seats (offered in some much less expensive Hyundais and Kias), a heated steering wheel (one is optional in the non-F), an upholstered instrument panel, steering-linked headlights, a lane departure warning system (okay, they're a nuisance anyway), adaptive shocks (one reason the SRX rides and handles better), or an active rear differential (another reason the SRX handles better). As noted above, the V6 engine in the RX 350 lags competitors in technology and power if not refinement and efficiency. Probably because they were designed to fold in a single step to form a nearly flat floor, the 40-20-40 rear seats in the RX 350 aren't nearly as comfortable as the front seats. Passengers have plenty of room, but the seat cushion is too low to provide adults with thigh support and the seat back is too flat. The rear seat in the SRX isn't as roomy, and isn't much more comfortable. But I'd much rather spend time in the back seat of some other competitors. Most of the RX 350's controls are easy to understand and operate. I had few issues with the mouse-like "remote touch" control for the infotainment system aside from a sometimes slightly excessive number of clicks to get from one place to another. Rather, my issue was with one control whose placement and operation should be simple: the wheels that adjust the heated and cooled seats. I couldn't even find them until I, in a clear act of desperation, resorted to the (over 1,000 page!) owner's manual. It turns out that the center armrest slides and in its forward position entirely covers these seat controls. (More logically, the armrest can also cover a small change tray.) Even once I knew the controls' location, they're uncomfortable to reach and impossible to read at a glance. As noted above, I also found the stability control overly difficult to disable. A final niggle isn't with the controls per se. I've been using Pandora quite a bit, and for 2013 the RX 350 gained Lexus's app suite (when equipped with nav). But I was unable to test it, as these apps, unlike Cadillac's, require that an app also be installed on your phone. When my daughter tried to download and install the app, she was asked to log in. At this point we gave up. While someone who'll be driving the car for over a week will go ahead and install the app on their phone, this shouldn't be necessary. The Cadillac's controls have their own issues. While easier to see, they are harder to reach and operate. Most people might prefer those in the Lexus, but both require improvement. The F Sport looks better than the regular Lexus RX 350, and gets better fuel economy on the highway. If the crossover's performance fulfilled the promise made by the F Sport badges, the additional $1,675 it costs over a similarly-equipped regular RX 350 would seem very reasonable. Unfortunately, the Lexus RX 350 F Sport rides and handles so badly that the regular model would be preferable even if it cost the same. The F Sport folks at Lexus did such a good job with the new GS that this comes as a disappointing shock. They either didn't have as much time or money to spend tweaking the RX 350, they couldn't make the steering and suspension behave properly without making major changes, their hearts weren't in the project, or all of the above. For an entertaining crossover, a BMW X5, Infiniti FX, or even a Cadillac SRX remains a better bet. Among crossovers that are a half-size smaller, the Audi Q5, BMW X3, and Volvo XC60 R-Design are all much more fun to drive. If you have little interest in handling anyway, then check out the regular RX 350. It's a sales leader for a few good reasons, just not driving excitement. 3.5-liter V6 lags in tech and power, but not efficiency or refinement. Among the best cargo haulers in the segment. Lexus provided an insured car for a week with a tank of gas. Phil Coron of Meade Lexus in Southfield, MI, provided the regular RX 350. He can be reached at 248-372-7100. Eric Breda at Cadillac of Novi provided the SRX. He can be reached at 248-476-4466. 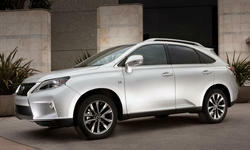 2013 Lexus RX pros and cons, according to Michael Karesh: the best reasons for buying (or not buying) the 2013 Lexus RX. Join TrueDelta to post your own impressions.